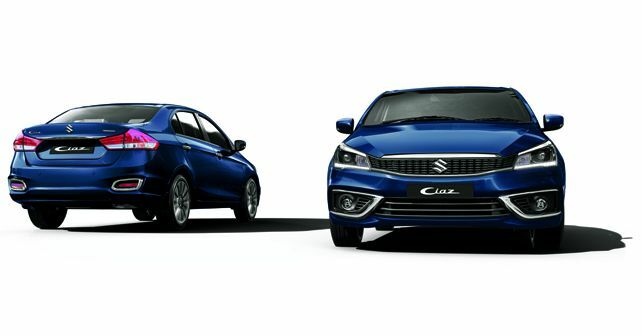 The new Ciaz marks the debut of Maruti Suzuki's first-ever in-house developed diesel motor, which replaces the outgoing 1.3-litre Fiat-sourced Multijet diesel powerplant. Maruti Suzuki has achieved an important milestone today with the launch of the new Ciaz variant featuring the brand's first in-house developed 1.5-litre DDiS 225 diesel engine. The new motor ensures improved performance, better fuel economy, NVH refinement and enhanced power & torque figures. Maruti Suzuki will soon introduce the motor on its other models as well. For now, the outgoing 1.3-litre Fiat-sourced motor continues to power current models like the Ertiga, Vitara Brezza and the S-Cross. Another important change to the Ciaz's diesel variant line-up comes in the form of a new transmission. While the earlier engine came mated to a five-speed manual gearbox, the new 1.5-litre motor comes with a new 6-speed manual gearbox. Like before, there is still no automatic option available for the Ciaz diesel. Further, the new diesel powertrain, unlike its predecessor, does not feature Maruti Suzuki's Smart Hybrid Vehicle System (SHVS). Despite being a non-hybrid, Maruti claims that this new motor is capable of delivering fuel efficiency of up to 26.82 km/l. With the erstwhile Ciaz Smart Hybrid Diesel was available in four variants – Sigma, Delta, Zeta and Alpha – the new 1.5-litre Ciaz diesel ditches the base Sigma variant, and the new line-up starts from Delta, which is now priced at ₹ 9.97 lakh (Ex-showroom, Delhi). This makes the new base variant more expensive by about ₹ 78,000 (Ciaz Smart Hybrid Diesel Sigma was priced at ₹ 9.19 lakh, ex-showroom Delhi). The new powertrain offers 94bhp at 4,000rpm and 225Nm of torque between 1,500 and 2,500rpm – about 5.5bhp and 25Nm more than the 1.3-litre motor. Further, with a new high-efficiency turbocharger, the 1.5-litre diesel engine generates better low-end torque, meaning that the power is available much earlier in the rev band, resulting in reduced turbo lag. The engine’s NVH refinement has been achieved by the use of a Dual Mass Flywheel (DMF), along with an optimised compression ratio that increases the smoothness of the engine. Also, the new motor uses a light-weight cast-aluminium cylinder head, which helps in increasing fuel efficiency. While the new motor is already BS-VI compliant, Maruti Suzuki will continue to offer the engine as per BS-IV norms as of now, until the new norms kick in from April 1, 2020.